Arrive in Beijing. Meet and assist. You will be transferred to your hotel by our professional guide. Rest of the day is free at leisure. City tour to Tiananmen Square, the largest square in the world. 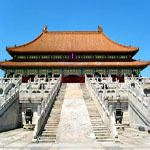 Visit Forbidden City, an imperial palace of Ming and Qing Dynasty. Visiting also Summer Palace, which is by far the best-preserved imperial garden in China. 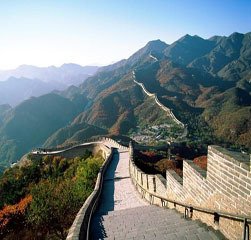 Visit the Great Wall at Badaling Section, Ming Tombs and Sacred Road. 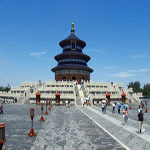 Visit Temple of Heaven, here ancient emperors prayed for good harvest. Take a richshaw tour of the Hutong- the narrow backstreets of Beijing, where you can experience the real life of local people. The rest of the day is free at leisure. Transfer to airport for domestic flight to Xi’an for next two nights. Visit the astonishing Terracotta warriors- the world famous historical relic, considered to be the 8th wonder of the ancient world. 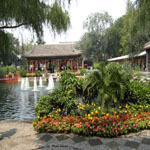 Visit Chanxi museum, Big Wild, Goose Pagoda and Ancient city wall. Transfer to the airport for domestic flight to Shanghai. Today you will see the Yu Yuan Garden, the old city area, the Bund and Nanjing Road. 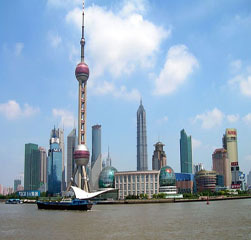 This day is free at leisure to discover Shanghai. After breakfast transfer to Shanghai airport for the return flight back. Travel to China is a must in a person's life. In this exiting, interesting and rewarding experience the experts' team of China Comfort travel wants to provide you with some basic information that will hopefully be of assistance to both novice and experienced travelers. China is the oldest uninterrupted major world civilization, with records dating back over 3,500 years. Successive dynasties developed a system of bureaucratic control which gave the agrarian-based Chinese an advantage over neighboring nomadic and hill cultures. Chinese civilization was further strengthened by the development of a common written language that bridged the gaps among the country's many local languages and dialects. The People's Republic of China (PRC) was established on October 1, 1949, with Beijing as its capital city. It is the third largest country in terms of territory, bordering most Asian countries and Russia. China is undergoing rapid, profound economic and social growth and development. Political power remains centralized in the Chinese Communist Party. The Chinese Government is subordinate to the Chinese Communist Party (CCP); its role is to implement party policies. The primary branches of state power are the National People's Congress (NPC), the President (the head of state), and the State Council. Under the Chinese constitution, the NPC is the highest branch of state power in China. When the NPC is not in session, its permanent organ, the Standing Committee, exercises state power. With well over one billion citizens, China is easily the world's most populous country. The largest ethnic group is the Han Chinese, who constitutes about 92% of the total population. The remaining 8% are Zhuang, Manchu, Hui, Miao, Uygur, Yi, Tibetan, Mongol, and Korean. The Chinese currency is called Renminbi (RMB). (In Chinese, the people's money). The unit of currency is Yuan (, popularly called Kuai. The smaller denominations are the Jiao (popularly called Mao) and the Fen. One Yuan equals ten Jiao and one Jiao equals ten Fen. Notes include 100, 50, 20, 10, 5, 2 and 1 Yuan, 5, 2 and 1 Jiao and 5, 2 and 1 Fen. Credit cards are accepted in most establishments as a form of payment trough out the country. Master Card, Visa Card, American Express Card, JCB and Diners Card are the most used ones. You can also withdraw RMB at braches of the Bank of China, ATMs (Automatic Teller Machine) or some appointed shops with your credit card or with your European EC (electronic cash) card. We suggest you inform yourself at your local bank for further information. There is no limit on the amount of foreign currency you bring to the country but you must declare this amount when entering China. You can only exchange money with your original passport at officially appointed banks and shops. Keep the exchange receipts. You will need them when having the RMB converted back into your own currency when leaving China. Bring as little as possible. The huge variety of products available in China's markets will probably stimulate your shopping activities. Hence, you want to have as much capacity as possible to avoid excess baggage on your way back home. However, articles of personal use from your usual brand can be difficult to find in some rural areas. We suggest you bring articles like: personal tooth brush, bathing articles, contact lens solution, daily toiletries, suntan oil, shaving items, disinfectant tissues and bandage. China's climate can be bitter cold during winter or extremely hot during summer. There is actually no one times in the year when the weather is ideal. The Yangtze River serves as China's official dividing line between north and south. The warmest areas in winter are the South and Southwest, such as Sichuan, Xishaungbannai in Yunnan, and Hainan Island. However in summer these areas can be unbearable hot. In summer the coolest spots are in the far northeast and Heilongjiang. In winter these areas are extremely cold reaching down to -40°C. For instance, in Beijing temperatures can reach -20°C very dry and no sun in the winter and 38°C very hot and sunny in the summer. Do not show your money in public. Try to carry small amounts each time you go out. Leave your valuables in a safe place. You do not need to carry your passport at all times. A copy of it works too. Avoid traveling to places not opened for tourists. There are post offices in cities and towns throughout the country. Express mail services like DHL, TNT, FedEx are also available. In China you can find available telephones in Hotels, post offices and street Kiosks. From these you can also make international call. IP cards can be bought in post offices and are especially convenient for long-distance calls. In bigger cities you can find internet access points like cyber-shops and business centers in Hotels where you can connect mostly 24/7. In the big cities Hospitals and clinics meet high standards of medical care. However, in some rural areas this might not be the case. At all events, we suggest that you check your health condition before departure to avoid unnecessary health issues. We also recommend you consult your doctor for required immunizations. In case you need further advice on local medical services you can call the SOS international in Beijing (010-6542 9100) or in Shanghai (021-6295 0099). Voltage in China is 220V, 50 HZ. Furthermore there are two kinds of sockets, flat blade plug and V-shaped flat prongs. In any case we recommend you bring a plug adapter with you if your plugs don't match this description.